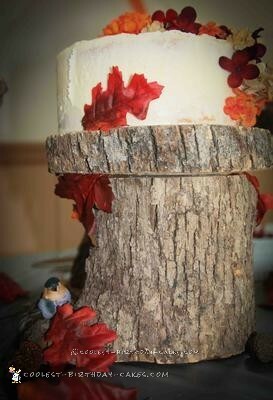 This was the first wedding cake I ever made. I was married on October 8, 2011. While planning the wedding we ran into numerous problems (ruined wedding dress, photographer quit with 25 days to go, etc.) including the cost of a wedding cake. I talked to several bakeries and one price was $415 for 260 servings while another was $360 for a 260 servings (white cake iced in buttercream with no decorations)! Needless to say, I wasn’t going to pay that! I should mention that my interest in cakes started when I was a freshmen in high school. I did a few cakes for family, but never thought I would ever do a wedding cake. As it turns out, the cost of cakes drove me to making my own! I had confidence in my baking skills. It was just the design that had me worried. I enlisted the help of my sister (Maid of Honor) and we made a practice cake. It turned out that it didn’t look so great. 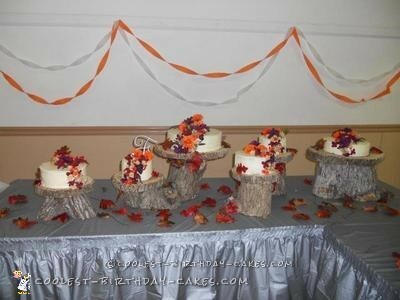 Several designs later and I knew what I wanted – a wedding cake with a simple design on a wood board. 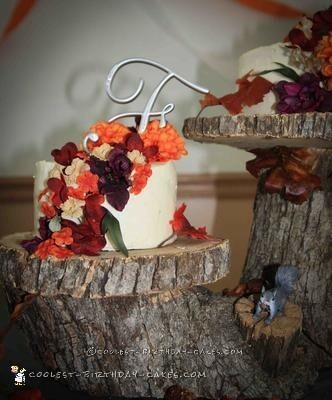 Our next problem was finding a tree big enough to hold the bottom tier of the cake. As fate would have it, a tree fell at the location where the pony’s we take care of live, so we grabbed a chain saw (groom-to-be and future father-in-law-to-be) and went to cut it up. We got all of the pieces cut and my dad made the remark that we needed a squirrel on it. Even though he was joking, I was up for any challenge, especially when it came to making my country wedding look classy instead of trashy. After a trip to Michael’s we not only had a squirrel, but a bird as well. Soon enough the wedding weekend arrived. We spent Friday decorating the hall and setting the cake up. My simple design proved to be a little challenging to accomplish under pressure, so instead of being bridezilla we added a cascade of flowers on each tier and voila… the cake was better than I had imagined. Throughout the reception I never once received a bad comment on the cake and almost a year later people still talk about how good it was. Needless to say I was one happy bride! Birthday cake idea Posted by Catherine F.